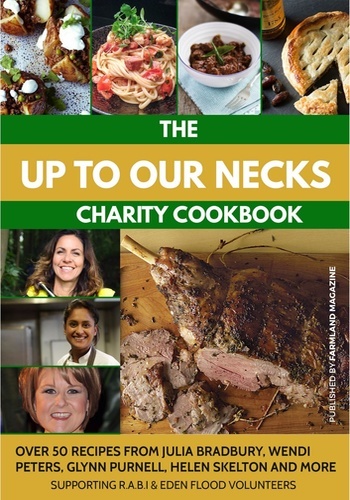 The Up to Our Necks Charity Cookbook is now available. A selection of over 50 recipes donated from Celebrities, Businesses, Farmers, Cooks & Foodies from the UK & beyond. Including recipes from Julia Bradbury, Helen Skelton, Wendi Peters to name but a few. 100% of the book sales will be donated to the Royal Agricultural Benevolent Institution and Eden Flood Volunteers, both organisations have been fundamental in rebuilding lives and communities after recent floods left much devastation across the country. Your book purchase will help towards improving the lives of the many thousands of people that have been affected.